I’ve been watching a lot of Barney Miller episodes lately. That may seem odd to you, but I have always loved this sitcom that follows the men (and women) from the 12th Precinct in Greenwich Village, New York. I’ve talked before of my fondness for Abe Vigoda (who is still alive today), but the entire cast was perfect in their roles. Wojo, Harris, Yemana, Dietrich, Inspector Luger, even Officer Levitt. And of course, Captain Miller himself. Great ensemble, and unique in that every episode took place entirely within the Squad Room. Growing up in the ’70s, this show was a favorite of mine, along with Welcome Back, Kotter (“up your nose with a rubber hose!”) and Happy Days (“Ayyy”). 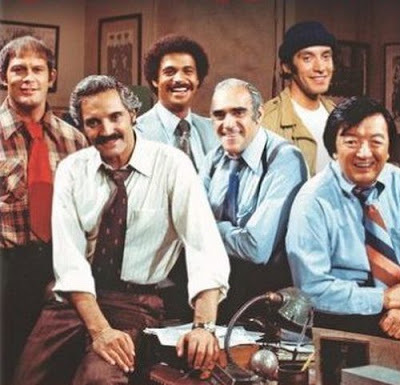 The humor in Barney Miller holds up well – I still laugh out loud constantly – but it does come across as a little dated when watching it today. Which is exactly what I like about it! Mr. Groovy Lava Lamp here, remember? If I could get away with having shag carpeting and fake wood paneled walls, I would. (Hint: I can’t. The about-to-be-missus would never allow it). The detectives are always typing up their reports, for instance. On typewriters. They smoke cigarettes casually, filling the squad room with a cancer-causing smoky haze…and nobody seems to give a damn. The way they dress can only be described as urban ’70s un-chic. Those ties! That plaid! Most interesting of all are the stereotypes/attitudes prevalent during that time period. Two episodes in particular stand out: there is one in which a health scare keeps them quarantined in the precinct overnight, where they are forced to share space with a couple of very flamboyant gay men who make Nathan Lane seem tame in comparison. The actors were over the top, and the squad’s reaction – especially curmudgeonly old Inspector Luger, who trots out every homophobic stereotype imaginable – is drastically different than it would be today. In the other episode, Wojciehowicz (yeah, I had to look that up) unwittingly brings in pot-laced brownies, and everyone but Captain Miller gets high. It’s portrayed in a very wacky, exaggerated way, and Barney’s constant referral to “hashish” is unintentionally hilarious. Don’t get me wrong, both episodes are hilarious, but they would be so different if filmed today. What would Detective Fish and the others think about legalized gay marriage and recreational marijuana use? Not to mention tablets and smart phones and cigarette bans? It makes me long a little for the “good ol’ days” (though the racism and homophobia would kill me). Perhaps that’s why I’ve been having fun with my Facebook timeline recently. 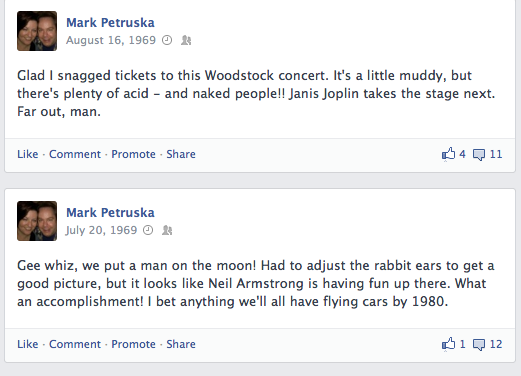 I simply asked myself, what would people have posted online if Facebook had been around since the ’60s? And came up with these gems. Some might say I have too much time on my hands, but I’ve gotta say: the comments alone have been priceless. I’d copy and paste those too, but there’s not enough room. Trust me when I say, my friends rock! The truth is, I do long for a simpler time. As much as I’m addicted to Words With Friends and uploading pics to Instagram, I wouldn’t mind giving all of that up for the relative innocence of 40 years ago. I would be perfectly content reading books in my spare time, or choosing from three television channels. 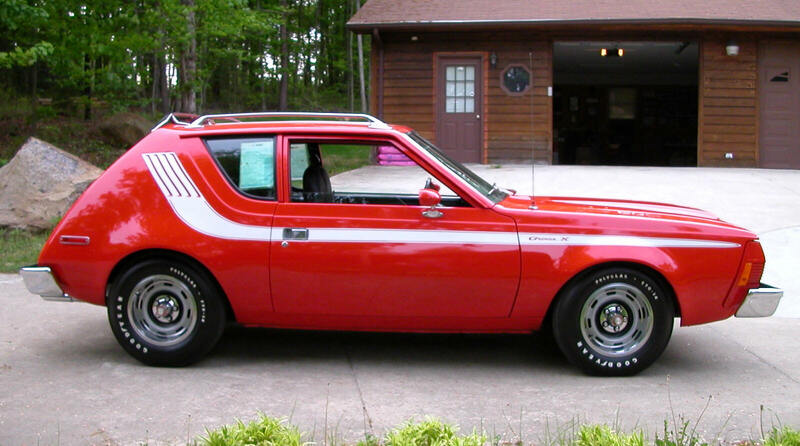 There would be fondue parties and wine coolers and I’d dress for work the next morning in my corduroy blazer with tweed elbow patches and drive to the office in my Gremlin. Yeah. Life would be good. I love this car! Seriously. Mr. Nostalgic is what your name should be. I love these blogs. You are able to transport us back with you to a simpler time. How I long for those days as well. Life was just life back then. And to think of all the interaction we got. Now, for some, it’s nonexistent and that is very sad. Long live the 70’s sitcoms!! I’ve been known to wax philosophically over past events from time to time, lol. Then again, the grass is always greener, right? Nowadays you can just plaster a digital filter over it to make it even brighter and upload it for the whole world to see. The world may be a more open place, but it’s a lot less private, that’s for sure. Let’s not forget 70’s dramas, too. C*H*I*P*S, anyone?! CHIPS? OMG Eric Estrada was so stiff! You were just born too late Mark! I also love Barney Miller, but I have been watching old re-runs of All in the Family lately myself. Next week, wedded bliss! I sometimes think I was! Lol. I loved All In The Family too, but didn’t always get the humor. At 6 or 7 years old, that’s not exactly surprising. Wedded bliss for you I mean! Mark, I used to watch all three of the shows you mentioned above. LOVED THEM! As you know, I too am such a nostalgia buff and love looking back at times when they were simpler. Exactly! A typerwriter? OMG…do they even exist anymore? Loved reading your FB comments, especially the second one because I actually remember watching that on TV! They do exist, Ron. But mostly in vintage stores or garage sales. When I graduated from high school, my big gift was an electric typewriter. Which means I’ve just aged myself on my own blog! Hell, I should be logging onto Facebook more often. This is hilarious! Seriously, what a fascinating question! I may need to take a peak at those comments. I can only imagine! They do say those who don’t learn from the past are doomed to repeat it. I figure, I’m providing a great public service by posting these! 60s ? “$4 for a tab ? Come on man, Rainbow sells ’em for $2. OK then but lemme keep your Led Zep album till we come down (about 10 days). And throw in some brownies”. – almost everyone I knew.